Speaking the language of the coyote is an art that professional caller Vern Howey has been practicing for over 35 years. During this period of time he has come to develop and understand coyote behavior and vocalization. Calling the Elusive Coyote contains a wide range of information critical to the success of calling coyotes. In this video Vern explains the various types of prey calls on the market and then demonstrates various methods of use. He will also speak in detail about the importance of pitch and volume in your calling. Vern explains the importance of selecting a stand and its role in successfully calling a coyote to you. He will discuss the importance of terrain and the best types of locations to make your stand, along with the importance of camouflage. He also describes the various types of ammunition on the market and its role in bagging the elusive coyote. 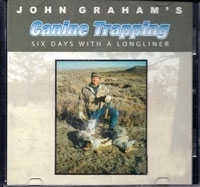 John Graham - Six days with a long liner. Ride along with professional trapper John Graham who was county predator agent for Garfield County for 11 years. Filmed on location in Eastern Montana. In the months of October and November. Approx. 120 minutes. Fox and coyote are among the most challenging animals to trap. Canines 2000 is your video guide to success in catching these animals. All aspects of canine trapping are covered in this two hour instruction course with Hal Sullivan. Learn how to make a canine trap most effective. Canines 2000 shows you the step-by-step procedures to adjust and modify these traps. You will learn the essentials of trap placement, trap bedding and trap covering, including techniques for blending sets to match their surroundings. You will also get an in-depth look at the two types of sets that form the basis for most canine trapping. I wrote Coyote Fever back in 1978, now 34 years later it ranks as the No. 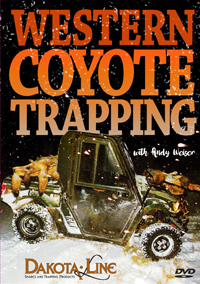 1 best-selling coyote trapping book ever. 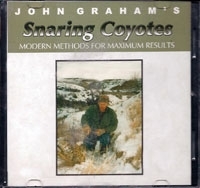 In this instructional DVD I have visually shown the viewer the methods and techniques that I have employed over the past 36 years to trap coyotes. Those of you that have followed my career know I am from PA and have worked my way west, via seven years in Kansas to settle here in the Rockies of NM for the past 29 seasons. Through these years of commercial long-lining I have piled up some catches that border on the unbelievable to the average trapper. I dont mean this as a boast, but merely a fact. That know-how is now available to you herein. Johnny Thorpe shows you many sets and techniques in this video which will make you a better all-around coyote trapper. Johnny covers the dirt-hole, the spring-hole, the flat set, the hole set, the tree set, and many other variables such as lure, urine use and bait stations. 115 minutes. To a beginner or less experienced trapper, coyote trapping can seem overwhelmingly complicated and difficult, with endless supposedly essential details to be mastered. Add to this the coyotes mystique of allegedly being intelligent and very difficult to outsmart, and many beginners give up after their first efforts fail. Some are too intimidated to even try. In reality, many coyotes can be fairly easy to catch - once the simple basics are understood. This video explains and shows those basics in extremely close, clear detail. It covers traps, equipment, and set making, as well as location. You will see a number of coyote catches from Bob Noonans trapline, along with 11 detailed pen and ink diagrams of these productive locations, with explanations of why they worked. Professional trappers with thousands of coyotes to their credit use uncomplicated methods and equipment. This video focuses on these simple essentials. Once you understand these straightforward basics, you will catch coyotes. Whether you are a trapper wanting to increase your coyote catch, or a deer hunter or farmer wanting to control coyotes, this video is for you. Follow professional trapper Matt Jones through the forest, upland fields, and river bottoms of Illinois, Kentucky, and Tennessee. Eastern trappers trap in the worst conditions in the United States and have to deal with rain, snow, and wet conditions on a daily basis. The methods in this video will show you how to keep your coyote sets working in even the worst weather conditions. This video covers traps, equipment, and techniques needed in the Eastern United States. These methods will help you catch a truckload of coyotes so sharpen your skinning knife and get ready to enjoy Coyote Trapping East of the Big River. 1 hour 30 min. Are you satisfied with your coyote catch? Would you like to take it to the next level? Professional trappers Casey Payne and Trent Masterson take over 120 high plains coyotes in just two weeks while producing this DVD. Filmed on Caseys working trap line in eastern New Mexico, you will see exactly what it takes to put up big numbers of coyotes during the fur season. You will learn precisely where to set so that the vast majority of coyotes come to you rather than you going to them. This will save you time, miles, and money yet increase your catch. See master coyote fur handling techniques that will simplify the task and maximize your return. Add your hard work to the knowledge you will gather from these two pros and be the Top Dog in your area. Over 2 hours of intense action and education. Join professional Trappers and biologist Mark June, as he teams up with full time ADC agent Rusty Johnson, as they work paying jobs in three states during different months of the year. They hold nothing back, showing you in great detail how to catch large numbers of coyotes right out of the gate...in those critical first nights your traps are set out. Fast paced, in-the field action, filmed in high quality SONY digital technology - shows you how to get the coyote numbers reduced in your area! 120 minutes. Once you learn the basics of making the dirt hole - from the size of a mouse to a badger hole, from a well blended set to 3-4 feet of scratched out rough digging - you will see they can be used in any part of the country and are deadly. I like working the dirt hole with the flat set and I have no set pattern. I try to let the location tell me what to do, using what is available in the area. My sets are fast, simple and effective, using good equipment and good lure in the right location. Location is the key in all trapping! 2 hours 30 minutes. This instructional coyote video concentrates on making the variations of flat sets both east and west of the Mississippi River. These sets can be used anywhere, but really come into their own at game trails, dry washes and all types of access roads. Use any type of backing - bone, wood, rocks, cowpies, etc. - different ways to blend them in. (People walk right by!) Also includes how to work among cattle. By using a variety of flat sets, you will be more successful at trapping coyotes, especially the wise guy. Fast and easy to set up, but a lot of trappers overlook their effective use. 2 hours. Ride along with professional trapper and biologist Mark June on his predator trap line where he explains in great detail what it takes to consistently catch coyotes. Well known for his trapping expertise, high energy, and ability to catch large numbers of canines, Mark provides two hours of non-stop instructions and action packed trap line footage. 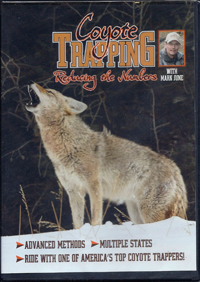 Volume 1 focuses on all aspects of catching coyotes and is a complete course on catching coyotes in all fur zones. Professional trapper and biologist Mark June dives deeper into catching more coyotes in Volume 2, as you ride along with him on his high production trap line. Well known for his trapping expertise, high energy, and ability to catch large numbers of canines, Mark explains in great detail ADVANCED METHODS that will consistently catch coyotes anywhere. 2 hours. The most intense course on snaring of all time. Featuring: The new Senneker Powersnare Trigger, the use of kill poles, use of Ram Powersnares, Use of tree tied snares, use of Canadian Bush Trapper Snares, Snare Locks, Snare Supports, Cable Configuration, Breakaway Devices, Kill Springs, Choke Springs, Loop Sizes, Snare Hardware, and much more! 3 hrs 22 minutes. Join Wayne and his boys on their coyote line from the sandhills to the mountains of New Mexico. Wayne has been a trapper for 50 years and a government trapper for 16 of those years. Now Wayne is a private predator controller year round and does his own fur trapping in the winter. Wayne developed these methods to take coyotes by the hundreds and to take the stock killers too. These methods are geared for the high roller and the part timer as well. Nothing fancy... just solid coyote trapping methods: fast easy common sense sets, the right way to take coyotes with flat sets in numbers. Location location location! Different luring techniques and change up sets. You will see coyote after coyote in traps and why they are there. This video is from 1990 to 2006, lots of miles and years in this video. Follow trappers Matt Jones & Len Williams to reveal the Secrets of the Eastern longline. Learn the methods these trappers use to take truckloads of bobcats, coyotes, red fox, & grey fox. This video focuses on harvesting the maximum amount. 120 minutes. No other man in modern times has amassed such amazing coyote kills as Marty Senneker of Alberta with a seasons best topping the 950 coyote mark. All of Sennekers coyotes were taken during the five month Alberta coyote season of which 98% were trapped/snared. Senneker is also the inventor of the deadly Stinger Kill Spring TM, the most deadly snare component ever conceived for the common neck snare, rendering it a true humane snaring device and ensuring its future as a tool for the Fur Trappers and animal Damage Control Agents for many years to come. 2 hours 13 minutes. Blind set locations are often overlooked. In this DVD we will be talking about how and where to make blind sets. It does not matter where you are trapping, dry washes in the Southwest, trails in the mountains, or back east in farm country, just pay attention while working your regular line and those set locations will just come up and slap you in the face. You can just visualize that animal walking down through there and hitting that trap. In my opinion the blind set just adds one more notch to your skill and ability to catch animals. I have always found it very challenging and it really gives you confidence as a trapper. Come join me on my eastern line and then we will head out west for some more trapping. A brand new DVD for the serious coyote trapper. This wet weather methods DVD is for the knowledgeable canine trapper that intends to catch a coyote with every single trap. 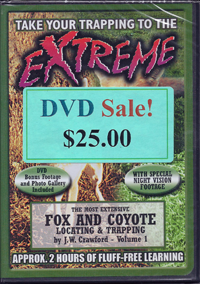 This DVD will keep you catching coyotes even if it rains two inches every single day. Modern methods for maximum results. Filmed in Eastern Montana. Learn from a veteran professional snareman. Covers locations, bait stations, snare height and loop sizes, cable and lock preference, support systems, break-away usage, and equipment for snaring. Trail snaring and fence snaring covered in detail. 120 minutes. 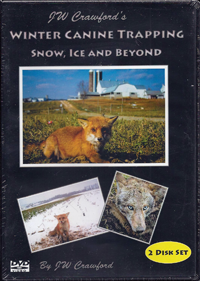 This extensive fox and coyote DVD covers locations for fox and coyote east and west, aerial footage of locations, blockage points, trap selection, detailed construction, and several types of hole and flat sets. We will teach you pure trapping fundamentals and locations. Includes special segment on the E. Coyote, trapping canines in extreme cold, snow, ice and rain, detailed locations for fox and coyotes, proper tools, equipment and traps for predator trapping are shown, special fox biology and denning segment, and dozens of actual trapline catches. This tape takes predator trapping to the next level. 90 minutes. Filmed on location in Idaho, Wyoming and Pennsylvania. Shows dozens of locations for Canines east and west. Covers detailed construction of sets for Fox, Coyote and Bobcat, special segment on change-up scents and lures, important information on Fox studies disclosed, dozens of actual trap-line catches, set presentation, double setting and trapping with a low population, pure predator trapping methodology explained in a simple and down to earth fashion, and an exclusive night vision segment on Fox. What you are about to see is the real world of coyote behavior around dirt holes. For the first time in trapping history the trapper gets to learn from the coyote, not a mans theory. See why a trap in the front of a hole is not the place to catch the coyote. There are patterns that coyotes have around sets. These patterns can be used to become a better coyote taker. Like it or not trappers have not had knowledge to take most coyotes that work a set, until now! Join Kyle Kaatz for two seasons of New Mexico Sandhills Coyote Trapping. This is not your regular instructional DVD! Filmed on a working trapline, under regular conditions. The coyotes will always be better instructors than those who pursue their hides. By riding along for 2 hours, you will see what the coyotes teach, from an observant perspective. See the memorable locations that made these two seasons a success. 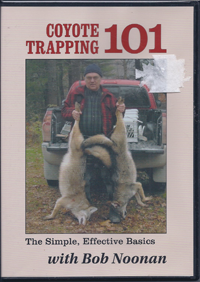 This is a DVD for those that seek a more in-depth knowledge of coyote trapping. Watch as the dingo learns to track coyotes on the drag. Understand dirt tanks, intersections, cow trails, and what you need to look for in a productive coyote location. The Way it is. With Mike McMurray. Back in the early 90s I did a video on trapping coyotes. Of course this was, made for VCR. I have had the video done on DVD and it is ready for release. 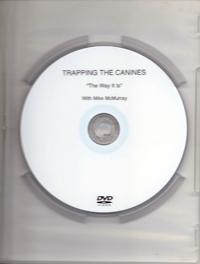 This DVD covers equipment and a lot of location info that is bound to help anybody better understand the canines and has a variety of sets. Now there are a couple of small glitches from the old film but it didnt bother anything. 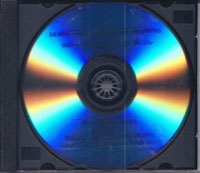 This is a very informative DVD! You will see Gary describe and then put into action the concepts of location, construction and attraction in trapping the most intelligent canine in the world. You will view a host of different locations and learn why these areas will guarantee exposure to a coyote. Gary also explains in meticulous detail, the construction of proven sets along with the terrain and areas in which they are to be located. You will see how using the proper type of attraction will bring Coyotes right to your set. Finally, you will witness the outcome of following Garys proven methods, as you see the elusive coyote trapped up close! Johnny Thorpes Western Coyote Trapping Video takes you with Johnny and his trapping partner, Pete Hammond, on their New Mexico coyote line. This DVD is fully chaptered and you will see some of the most majestic coyote territory known to man. This country is a true coyote badlands, and you will see snare sets, badger hole sets and dirt holes, just to name a few. 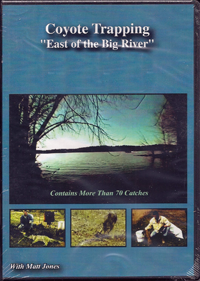 This DVD will put you a step ahead of your competition and you are sure to put more fur in your freezer with the techniques learned by watching two of the best trappers in the west. 85 minutes. They say late season canine trapping seperates the men from the boys. In this 2 disk DVD set, trapper and author John W Crawford explores every conceivable aspect of winter canine trapping, taking you along on several full scale working traplines, filmed in four states. Covers red fox, grey fox, and coyote trapping. 3.5 hours.